A perfect atmosphere takes less serene moments and creates special ones. At Pristine Beach in Puerto Princesa, the Philippines, ambiance is on high and set to “surround sound” with no gaps. There are no lapses of action in this moment. Armies of cicadas in the distance are setting time as “Waka Waka Africa” joins in to fill the background. This moment is perfect for thinking about.. well, nothing. The water is a wonderful mixture of green and blue. Across the bay, cloud-capped mountains are looking so green the possibility of them never feeling the touch of human beings crosses my mind, if only for a second. 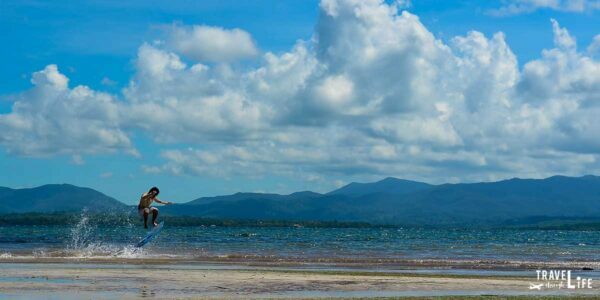 This Puerto Princesa travel guide is part of our series on Southeast Asia Travel. It was originally created on September 22, 2014. It has been maintained and updated (as of December 27, 2018) to reflect current viewpoints and travel trends. In reality, where HAVEN’T we been? Only one can hope there are some places still unknown to us all. Local families are having a swim and a group of boys are skimboarding and some are quite good. Friends are sharing drinks and overindulging but it’s okay. Nothing is getting in anyone’s way here. My mind in a perfect state, able to drift away and think. About nothing. Thanks again, to this beautiful atmosphere. The moment becomes plural and passes, along with a few drinks. Walking back to our hotel as the sun makes its way down, typical Palawan sites emerge. Kids are playing while motorbikes and tricycles take their places on the semi-paved roads. It’s noisy but still perfectly fitting within the ambiance and rhythm set back at Pristine Beach. Puerto Princessa made for a great beginning. If El Nido is better than this… My thoughts ran endlessly around that possibility that eventually came true. Summer vacation is just getting started and starting off with a bang, thanks to Puerto Princessa and this perfect atmosphere. This moment is one of the many that still inspire us to return to the Philippines. See more photos that will inspire you to do the same! We had heard so little about the Philippines before going there for our vacation. Upon arrival, we couldn’t understand why. It was absolutely beautiful! How long did you stay in Puerto Princesa? Hey! Great to see you stopping by! We only stayed in Puerto Princesa for a day! We wanted to head straight to El Nido and catch all the big action! Sounds like the perfect start to a vacation. I love the idea of finding a place that encourages you to “think…about nothing”! Sounds pretty lovely! Philippines is definitely on my to-do list when I make it back to Southeast Asia. Sounds like a beautiful and magical place. Thanks for sharing. Nice start for your vacation – definitely the right attitude for a relaxing break.